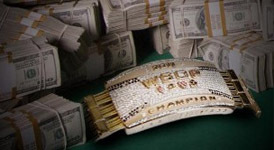 One week ago we were in the midst of the third of four starting Days for the 2011 World Series of Poker Main Event which attracted a total of 6,865 total entries, and now that number has been trimmed down to just 378 players heading into Day 5 of the tournament. The money bubble burst well before the dinner break this year and the eliminations just kept on piling up all night long as 853 players turned into 378 when all was said and done. The chip leader heading into Day 5 will be Manoj Viswanathan who was the only player who managed to eclipse 2 million chips, but there is plenty of players within striking distance including a trio of very dangerous young stars in EPT Snowfest winner Vladimir Geshkenbein, UK star JP Kelly, and POY candidate Ben Lamb. Some big names a bit farther down leader-board include Daniel Negreanu, Sorel Mizzi, Allen Cunningham, Erick Lindgren, and Eli Elezra. This entry was posted on Saturday, July 16th, 2011 at 9:53 am and is filed under Poker News. You can follow any responses to this entry through the RSS 2.0 feed. You can leave a response, or trackback from your own site.